Ramphotyphlops braminus is a member of Typhlopidae, a clade of small fossorial snakes commonly known as blindsnakes. Typhlopidae has a circumtropical distribution and includes approximately 213 described species distributed among six genera: Acutotyphlops (4 species; Papua New Guinea, the Bismarck Archipelago, and the Solomon Islands); Cyclotyphlops (1 species; Sulawesi); Ramphotyphlops (approximately 57 species; Southeast Asia, Christmas Island, Australia, New Guinea, the Bismarck Archipelago, the Solomon Islands, and New Caledonia); Rhinotyphlops (29 species; mainland Africa, São Tomé, Príncipe, Pemba, Zanzibar, the Middle East, and India); Typhlops (approximately 121 species; southeastern Europe, southern Asia (including India and Sri Lanka), subequatorial Africa, Príncipe, Bioco, Madagascar, the Comoros, Socotra, the Middle East, the Andaman Islands, southern Mexico, Central America, northern and central South America, and the West Indies); and Xenotyphlops (1 species; Madagascar). Like other blindsnake clades (Anomalepididae and Leptotyphlopidae), typhlopids are small (approximately 50950 mm) secretive serpents with smooth, uniformly sized body scales (they lack the enlarged belly scales that characterize most other snakes), highly reduced eyes, a small and ventrally placed mouth, and a very short tail which bears a sharp terminal spine in most species. Ramphotyphlops braminus is one of the most intensively studied species of Typhlopidae because it is an all-female species that reproduces parthenogenetically. This aspect of its biology, combined with its tendency to burrow among the roots of plants, has resulted in its accidental introduction via the horticultural trade into many areas far outside of its natural range (e.g., Africa, Madagascar, the Seychelles, Mexico, Central America, the Hawaiian Islands, Florida, and even Boston, Massachusetts). Its tendency to stow away in the soil of potted plants has earned this species the common name "flowerpot blindsnake". Interestingly, Ramphotyphlops is distinguished from other typhlopid genera solely on the basis of morphological characters associated with the male urogenital system. Thus, it remains unknown whether this all-female species is properly placed in the genus Ramphotyphlops. Most recent phylogenetic analyses have placed Typhlopidae together with Anomalepididae (dawn blindsnakes) and Leptotyphlopidae (slender blindsnakes) into Scolecophidia. However, the interrelationships among the three clades of blindsnakes remain poorly understood, and the monophyly of Scolecophidia has not yet been strongly corroborated by either morphological or molecular studies. Our current rudimentary knowledge of blindsnake systematics may be attributed to two major factors: (1) blindsnakes are among the most highly miniaturized of all vertebrates (most species are less than 5 mm in diameter), making detailed anatomical studies both difficult and time-consuming; and (2) blindsnakes are, in general, poorly represented in museum collections (several scolecophidian genera are known only from type specimens or very small series of specimens), making destructive anatomical studies and/or tissue sampling unfeasible for many key taxa. 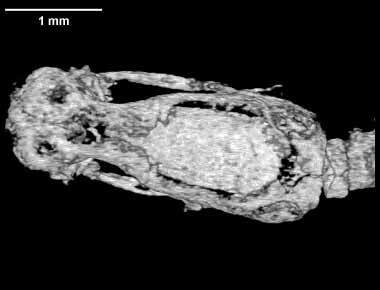 Because high-resolution CT scanning is non-destructive and can provide detailed, three-dimensional reconstructions of even the smallest vertebrate skulls, this technique may facilitate broad comparative studies of scolecophidian morphology, thereby offering valuable insight into the interrelationships and phylogenetic affinities of blindsnakes. Moreover, because Scolecophidia is generally considered to be the sister group to all other snakes (Alethinophidia), such studies would also be highly informative in the broader context of squamate evolution. This juvenile specimen of Ramphotyphlops braminus illustrates many of the distinctive morphological features of typhlopid blindsnakes: a relatively short subterminal lower jaw; large triangular coronoids rising high above the lower jaw; relatively long retroarticular processes; highly reduced dentaries which lack teeth; long, thin, toothless pterygoids; arch-shaped, toothless palatines; transversely oriented maxillae (the only bones in the skull bearing teeth); a large bulbous snout; and undivided trigeminal foramina (to mention but a few). However, perhaps the most peculiar anatomical feature visible in this specimen is the large frontoparietal fontanelle. Although similar fontanelles are known in several Old World species of Leptotyphlopidae, they have not been noted previously in Typhlopidae. This specimen was collected in Phang Nga, Muang, Thailand. It was made available to The University of Texas High-Resolution X-ray CT Facility for scanning by Dr. Jacques Gauthier of Yale University. Funding for scanning was provided by a National Science Foundation Digital Libraries Initiative grant to Dr. Timothy Rowe of The University of Texas. The specimen was scanned dorso-ventrally by Richard Ketcham on 8 January 2002 for a total of 403 slices, each slice 0.01 mm thick, with an interslice spacing of 0.01 mm. Evans, H. E. 1955. The osteology of a worm snake, Typhlops jamaicensis (Shaw). Anatomical Record 122:381-396. Haas, G. 1930. Über das Kopfskelett und die Kaumuskulatur der Typhlopiden und Glauconiiden. Zoologische Jahrbucher Abteilung fur Anatomie und Ontogenie der Tier 52:1-94. Haas, G. 1964. Anatomical observations on the head of Liotyphlops albirostris (Typhlopidae, Ophidia). Acta Zoologica 45:1-62. Haas, G. 1968. Anatomical observations on the head of Anomalepis aspinosus (Typhlopidae, Ophidia). Acta Zoologica 49:63-139. Iordansky, N. N. 1997. Jaw apparatus and feeding mechanics of Typhlops (Ophidia: Typhlopidae): a reconsideration. Russian Journal of Herpetology 4:120-127. Kley, N. J. 2001. Prey transport mechanisms in blindsnakes and the evolution of unilateral feeding systems in snakes. American Zoologist 41:1321-1337. List, J. C. 1958. Notes on the skeleton of the blind snake, Typhlops braminus. Spolia Zeylanica 28:169-174. List, J. C. 1966. Comparative osteology of the snake families Typhlopidae and Leptotyphlopidae. Ill. Biological Monographs 36:1-112. Mahendra, B. C. 1936. Contributions to the osteology of the Ophidia. I. The endoskeleton of the so-called 'blind snake', Typhlops braminus Daud. Proceedings of the Indian Academy of Sciences 3:128-142. McDowell, S. B. 1967. Osteology of the Typhlopidae and Leptotyphlopidae: a critical review. Copeia 1967:686-692. McDowell, S. B. Jr. and C. M. Bogert. 1954. The systematic position of Lanthanotus and the affinities of the anguinomorphan lizards. Bulletin of the American Museum of Natural History 105:1-142. Mookerjee, H. K. and G. M. Das. 1932. Occurrence of a paired parietal bone in a snake. Nature 130:629. Rieppel, O. 1979. The braincase of Typhlops and Leptotyphlops (Reptilia: Serpentes). Zoological Journal of the Linnean Society 65:161-176. Smit, A. L. 1949. Skedelmorfologie en -kinese van Typhlops delalandii (Schlegel). South African Journal of Science 45:117-140. Underwood, G. 1967. A Contribution to the Classification of Snakes. British Museum (Natural History) Publication Number 653. British Museum (Natural History), London. To cite this page: Dr. Nate Kley, 2002, "Ramphotyphlops braminus" (On-line), Digital Morphology. Accessed April 19, 2019 at http://digimorph.org/specimens/Ramphotyphlops_braminus/head/.